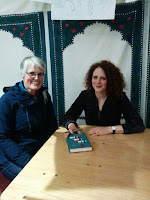 I had just finished book 27 of the year and was about to go to France when I published my last blog. I'm now reading book 36, so it has clearly been far too long between posts. I blame arriving back from holiday on Sunday evening and then being catapulted into a much busier role at work on the Monday! I've just about recovered my sense of equilibrium, so hopefully I'll be writing more regularly again. 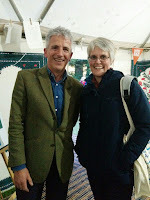 Headline news...I HAVE MET PATRICK GALE AND MAGGIE O FARRELL!!! More detail below the McEwan review! The final one was a novel in draft form by a friend of mine, so I'm not going to reveal anything about that until it reaches its publication phase. Those of you who are loyal readers with a good memory might be noting that I have read several of these titles before. That is the joy and irritation of teaching A Level! It is coursework time and students can choose a text to accompany a set book. I make sure that I read or re-read all the choices so that I can be at my most useful with advice. It is a joy because a good book just keeps on giving and an irritation because there are so many other titles out there and a lifetime isn't long enough! I admit however, that my re-reading of The Reluctant Fundamentalist was a revelation. I thought it was a good book the first time round, but the second read was even better. I made connections I hadn't done initially and the writing is supremely clever. Anyone interested in a post 9/11 society should read this book. It challenges stereotypes, preconceptions and attitudes. It intrigues and appalls in equal measure, and it is written in a dramatic monologue but with the twists and turns of a thriller. An important piece of literature and definitely on my list of must-reads. Finished whilst sitting on a balcony over Lake Annecy, Black Dogs by Ian McEwan was another book with a political dimension. Bought for us by our children as part of our 25th wedding anniversary celebration, (the book was published in 1992), the novel features a fearful encounter in France which changes the course of the life of the protagonist. Remember where I was reading this! I can assure you however, that no black dogs plagued us on any of our Alpine walks, and so far, my life hasn't changed because of our stay there! The narrator of this novel is Jeremy and he is reconstructing the lives of his parents-in-law, Bernard and June Tremain. Having promised June that he would write her memoir, she spent much of the last months of her life impressing upon him the significance of the encounter with two dogs on a french mountain pass. The incident becomes a source of contention, with Bernard dismissing it as no more than a frightening moment made worse by local gossip and lore. June however, felt as though she had come face-to-face with, even wrestled with a physical manifestation of evil. The book operates on two levels. Firstly it is a love story, a broken one, where passion and differences are never fully accommodated. Concurrently, it is an existential exploration, examining why we are here. A modern novel, it draws on a lifetime which experienced the Second World War and its political ramifications. It addresses the appeal of communism in the wake of the rise of Nazi Germany and shows how war affected individual lives. It could be considered bleak, "The evil I am talking about lives in us all. It takes hold of an individual...and everyone is surprised by the depth of hatred within himself." but at the heart of the book there is hope. This is carried entirely by the contentment of the narrator - Jeremy and his wife are happy - they have their family and know depth of love and security in each other. I liked him and his honest desire to reflect the truth about his in-laws and respect their histories. A relatively short novel, it is complex in its themes and well-constructed. 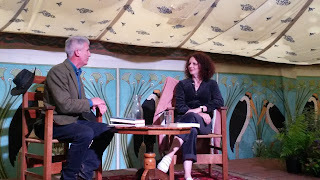 Before I go, I must share my joy at having completed a crazy weekend trip from Maidenhead to St Endellion for the North Cornwall Literary Festival. Seeing that my favourite authors Patrick Gale and Maggie O'Farrell (yes, I know, I could hardly contain my excitement either!) were appearing on the same stage meant that I really had no choice but to fill my car with petrol and head southwest. I had checked whether it was possible by train....when I said this to a local attendee in the damp marquee, she just laughed! At this point,I must point out that I have been to Henley Lit Fest and Oxford Lit Fest before...for my sis-in-law, this was her first one. When we arrived at a church hall for lunch, served by lovely ladies in the kitchen, I did wonder what I might have brought her to. This was not the Bodleian Library or the Kenton Theatre! The venues were two very soggy marquees reached by a path of matting to prevent an utter quagmire. Oxford it was not. But it was so good; the local feel to it (we were the only incomers that we found) made it a very intimate event. It felt as though Patrick Gale (he's the artistic director) had invited a few of his awesome author pals down for the weekend and we just happened to be there too! Hehe! This is me and Patrick! Blessed by waiting in the rain for Matt Haig's talk, we secured front row seats which we able to hold for James Naughtie and Maggie and Patrick, (first name terms you notice! I wish!) All the talks were good. 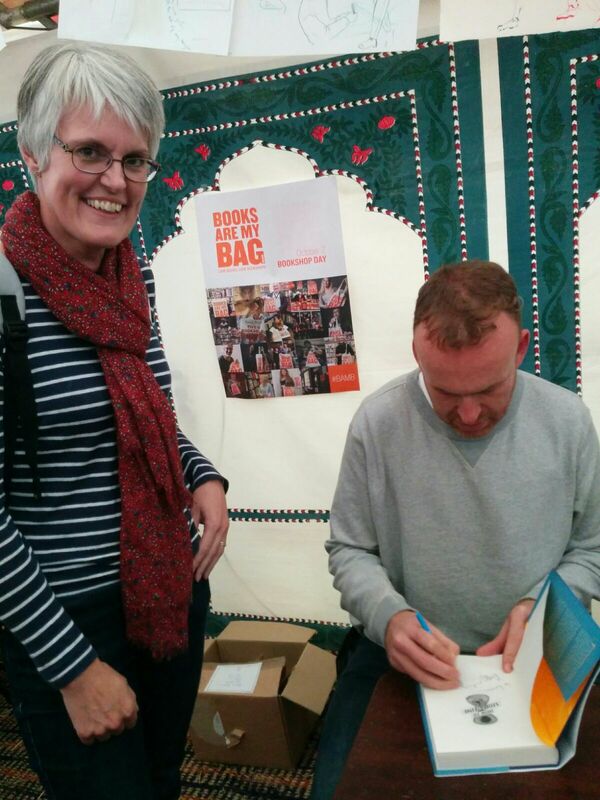 Matt Haig, whose book Reasons to Stay Alive is reviewed in another blog post, was incredibly entertaining. He is funny, warm and open to the audience. I am really looking forward to reading his latest novel How to Stop Time. James Naughtie was interesting as he read from his spy thriller Paris Spring; he too made us laugh by refering to the infamous Jeremy Hunt slip-of-the-tongue made whilst he was on the Today programme. I was slightly nervous for the O'Farrell/Gale finale....should you meet your heroes? and spoke of her family with deep affection. Then the damp got into the lights and they sat in disco red and green for a while, then in semi-darkness and then back to bright again. And it was this almost parochial feel to it that made it intimate. I don't think a photo opportunity like this would be afforded by the bigger festivals, and I certainly don't think a chat with the authors and their publicists would be possible. So I reflect on my North Cornwall book festival with a fuzzy warmth. It was an excellent weekend. We came home with new books and a sense of privilege at being welcomed by a very friendly team to an "exclusive" inclusive readers experience. Arts Council: please take note.